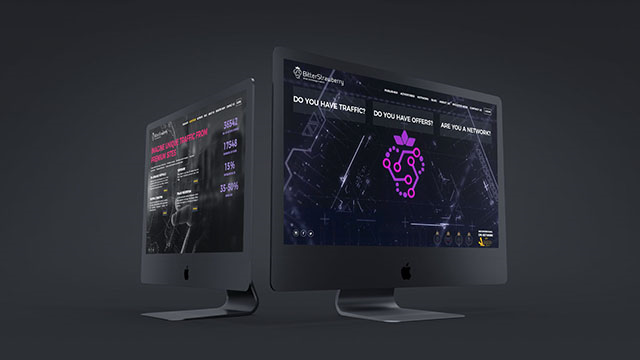 BitterStrawberry.com is a leading mobile performance network, focused on mobile traffic monetization. They operate from Switzerland, but spread their wings worldwide. It combines in-house technology, full-stack researchers, top affiliate marketers and offers from 20+ worldwide verticals. They focus on getting measurable results using four money-making concepts which can transform raw data into profit. BitterStrawberry works on CPA, CPC, CPI, CPL, and the Revenue Share model. They have an in-house technology platform which makes optimization easier for both advertisers and publishers. Publishers will get relevant ads for their website and their revenue increases, while advertisers get maximum ROI for their campaigns and the best conversion rate possible. The thing that I think is very important is that the BitterStrawberry performance network has just one minimum requirement for publishers. No matter how much traffic you have on your site, you can join the network. They focus on quality, not quantity. The only requirement is that you have quality traffic. But let’s see why you should definitely sign up with BitterStrawberry! BitterStrawberry has a lot to offer to both publishers and advertisers. For this reason, they have won consecutive awards for: the best mobile ad network, best mobile company and best company of the year from GFY; as well as their most recent award for the best CPA network received from the prestigious International Performance Marketing Awards. But let’s break down all the features that make them the mobile performance network in whose hands you should place your affiliate marketing business. BitterStrawberry allows you to optimize your campaign through multi-level filtering. You can filter everything by: Country, Operator, Connection, Device, Operating System, Browser, Time etc. They operate on six continents and in over 250 markets worldwide. They have more than 14.000 offers that spread to cover 20+ verticals. They process 500+ million clicks per month with over 4.6 million leads and offer their partners the possibility to set the capping on sales and clicks as well. All the people that work with BitterStrawberry are treated as VIPs and they are offered support 24/7 in multiple languages. A professional team of experienced affiliate managers are always on call to answer any possible question and help you optimize your campaigns. They are focused on increasing your ROI and revenue and they guarantee they can do it. What more reason for giving them a chance and making an account do you need? Most publishers worry about fake traffic and bots, but Bitterstrawberry puts their clients at ease with the new and unique tool they have developed. The Hybridlink is a benchmark tool that can not only give you a better understanding of your mobile traffic (in-depth stats, detailed on: country, connection type, carrier/WIFI, connection type, device, operating system, browser, time etc), but also helps fight fake traffic. 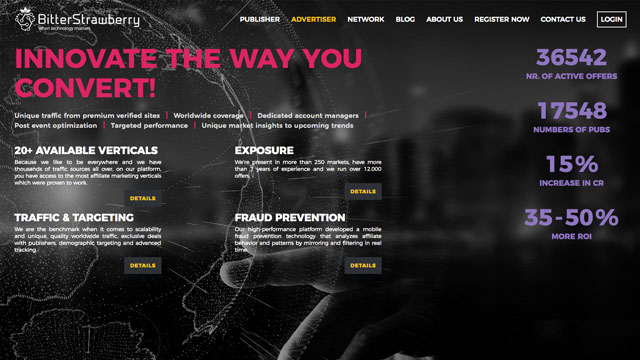 The Hybridlink has powerful AI technology that can figure out patterns and understand affiliate fraud profiles like IP patterns, session times, proxy/VPN, duplicate users, incentivized traffic, duplicate IP, user agents, cookie dropping, fingerprints etc. It will filter and clean every conversion and any suspicious sources or activity will be tested by sending the traffic to different pre-landers in order to verify fingerprints and patterns. The most important capability of BitterStrawberry’s HybridLink is that it lets you design a single URL made with the offers and rules you have chosen. While their benchmark SmartLink paired traffic with offers in the best way, it didn’t leave much room for personalization. The HybridLink is completely customizable so that it can fit all of your needs while at the same time bringing the same results. If there is any remnant traffic left after you’ve customized everything you wanted to, it will automatically be sent to the Smartlink which will make sure that 99.9% of your traffic is monetized and nothing is lost. You can check the video below to find out more about the HybridLink. The HybridLink is completely free and you don’t need any additional subscription for it. Just sign up once and you will get access to all their tools and every other perk these tools bring. What is more, it can reduce the time you spend pairing offers with traffic and so on, you’ll do everything twice as fast once you sign up as a publisher and get the hang of it. The Performance Tracker is another great tool by BitterStrawberry which you will gain access to for free once you make an account. The in-depth tracking it does is useful for affiliates, webmasters, social marketers and media buyers and helps them analyze their campaigns and target their most profitable users. It will give you important data about your users and the way they convert, and this will help you maximize the performance of your traffic. You’ll instantly know variables like the country of the visitor, which ad they decided to click on, the operating system of the phone they used when they did so, what time of day it was when they saw your landing page and more, information that can help you optimize your campaigns. All the statistics are updated every ten minutes so that you can see how everything is going and adapt, scaling up where it is necessary. The MoneyPlace is the upgraded version of their MarketPlace. This is a section where you can find all the offers that they have at the moment. There are about 14.000 direct offers available at all times and more than 200 new high conversions, direct, pre-tested offers are added every single day. You can set filters to see what’s hot or what fits your needs in terms of verticals, for example. Check the details of these direct offers (there are no re-brokered offers available) to see if the offers and the traffic match and then start promoting them. BitterStrawberry is better than other networks in terms of the things they provide to their publishers. Not only this, but the whole process is quite straight-forward. You have to sign up as a publisher and complete a form about your website. When you’re done you will receive an email or a notification with a link to your dashboard. Recently, BitterStrawberry has created a new publisher app so that you can see how everything is going even when you’re on the go. This means that you can keep an eye on everything and be notified in real time when you reach capping, or the offer expires, for example. BitterStrawberry has many advertisers and many publishers, which makes it possible for the whole system to work for everybody. Think of BitterStrawberry as a professional matchmaker that finds the best traffic for the right offer. They offer quality traffic which converts and have no fraud tolerance. If this is something you’re looking for then you should definitely join BitterStrawberry. BitterStrawberry has an excellent referral system that can bring 10% referral commission per user. This means more money for you if you know how to spin it. The mobile performance network has a threshold of $100 and pays out on a Net 5, weekly, biweekly and monthly basis. They always pay on time and this is really important and great because you won’t need to wait for months on end for your money. You can receive your money through PayPal, Paxum, Bank Wire Transfer, Payoneer, Webmoney and now even in bitcoins. Every other review I’ve found about them states that their payments work like clockwork! Recently, they have re-branded and have stepped into the tech era. BitterStrawberry promises to evolve your traffic and your offers and take your affiliate marketing business to the next level altogether. They even created a new publisher app in order to help you do so. Their recent awards show just how much they’ve improved over the years. They have my seal of approval at the moment and they don’t seem like they are about to stop growing and we’ll probably hear even better things about them in the future. They offer better payouts than the other networks and they care about the people they do business with and try their hardest to help them succeed. When using their tools and platform there is just no way your ROI will stay the same! 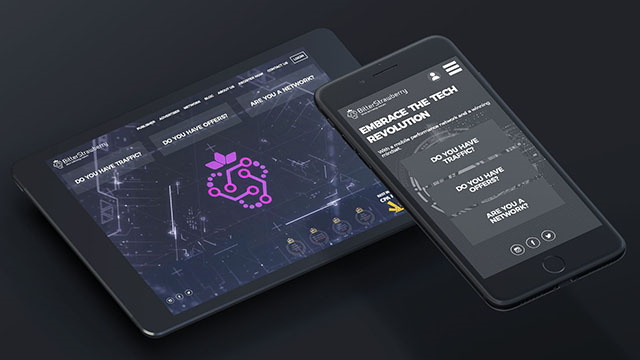 If you think that BitterStrawberry is the mobile performance network for you then make an account now and start making some serious cash!